Masterplug's easy to use open reel electrical cord keeper is perfect for use in your workshop, home, yard or light industrial project site. 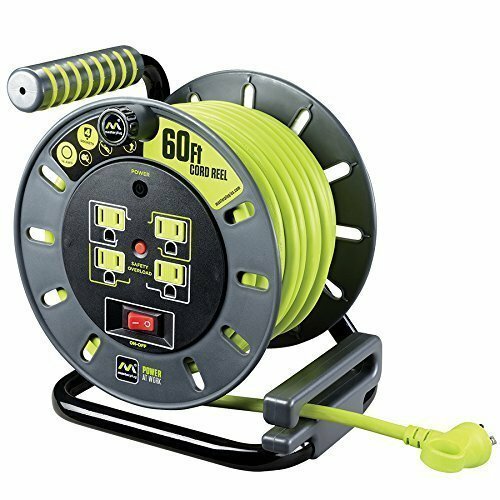 An integrated cord easily winds around a rugged spool that features four surge-protected outlets (120V / 10amp each) that ensure you have power where you need it. The durable construction and sturdy steel base ensures a long-lasting solution to keeping your extension cords neat and tangle-free. This reel is also designed to easily mount on the Masterplug Wall Mount Bracket (sold separately) for convenient storage. All Masterplug products are backed by our hassle-free 3 year warranty and available in 60-foot and 80-foot cord models to meet your specific power needs.